1) Looking back at year 1 what were some of your favorite moments, things you learned about yourself, things you want to improve on or plan to adjust this year as you head into year 2 as Director? One of my favorite moments, which was not so favorite at the time was Week 4 of our 5 game stretch. The students and the staff were absolutely exhausted. It had rained on 3 of the 3 previous games and it was forecasted to rain on this game and at rehearsals as well. However, at least to me, it was our most important game of the year. It was our Military Appreciation show. The Blue Band had pushed through practices during the week and it was pouring down that game day morning. I was doing my best impression of a motivational speaker as many students automatically assumed that we would not march due to the field being saturated from the rain. It felt as if there wasn't anything going right that morning as equipment and instruments began abnormally malfunctioning as we rehearsed in the band room. We started to run through the show music and we began to play America the Beautiful. I became overwhelmed with a sense of pride in this band that I never felt before. Despite everything that was going wrong, the Blue Band sounded absolutely AMAZING! I had to hold back my emotions as I realized that the students had determined that their success would not be determined by the conditions around them. At that moment, it felt as if everything turned around. The sun literally came out and dried the rain in time for the band to march on the field. We had a spectacular performance at pre-game and halftime. I received so many emails regarding the Military Tribute show and it was captured by ESPN's social media which quickly gained hundreds of thousands of views. There are so many things that I learned about myself. I learned that I have a lot to learn. I realized that being a band director at a university such as this extends beyond the music and the field. I have learned that I am dependent upon many departments (ex.School of Music, President's Office, Athletics, Admissions) including the students in order for the Blue Band to be successful. I have learned to be ok with not being in control. 2) How many rookies are you expecting to take this year? 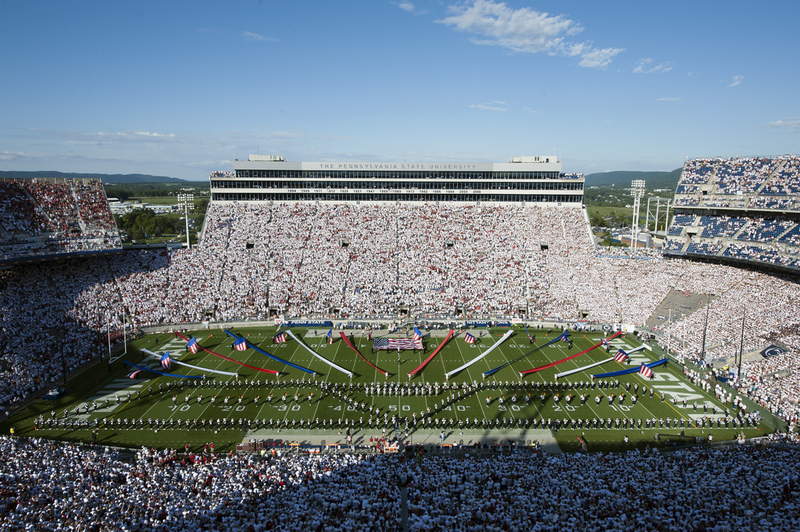 Where will the whole band travel to and which bands will be coming to visit Happy Valley? We are expecting 150 prospective members to audition. We are looking to accept approximate 100 of them. The full band will be traveling to Pitt as Penn State renews the in-state rivalry. We are not expecting any bands to visit Happy Valley this year which is unfortunate. I love it when bands visit Beaver Stadium as it is always great to see how different bands have evolved into their version of a halftime show. 3) You made a staff change this year. What do you hope that change brings to the band this year? The staff change this year was in our Assistant Director position. Our previous Assistant Director has moved on to a new position as a head director, of which I was very supportive. We have been fortunate to hire a new Assistant who has arrived ready to work. We are proud to add Dr. Corey Pompey to our Blue Band Family. Dr. Pompey fits right into our "student first" culture. 4) What are you excited about most as the season approaches? I am most excited to start the season. I am excited to experience the smell of marching band. You know.... the smell of fresh cut grass, sunscreen, valve oil, tarnishing metal, old uniforms, with a hint of locker room all mixed together. And since we are an agricultural school and our practice field is near the cow pastures...lets just say that Blue Band members know that smell as well. But I am most excited to see if I can assist this year's Blue Band to move from overwhelming potential to realized achievement. 5) What can we expect at halftime this year? Themes or concepts that you are planning? Anything special? You always ask what am I planning and I will never tell (haha). I want you to come see our shows LIVE! What you can expect from the Blue Band is a high caliber of musicians performing entertaining and musically challenging halftime shows. 6) How is your son Deuce's training coming along? Is he ready for a full day of band camp yet? Well now that Deuce is getting older (4), he is beginning to gravitate towards sports. But he does help his dad write drill and he always asks, "where did you put the tubas?" Tomorrow we are headed to Jacksonville, AL to hear from Ken Bodiford and the Marching Southerners! Stay tuned.